Keep it? Or PASS THE CROWN! We need your help! ( And there could be something in it for you!) Crown Royal has asked us to be part of their1st ever digital gift swap. Essentially, it's a "Yankee swap", where you keep the gift bag you're given or "steal" what the person before you got. Great gifts! So far, 2 iPads and a Happy Hour for 40 friends have been given. The best part: we receive 2 of whatever we get and will be giving one to a lucky one of you guys! So--- let us know why YOU should be the person to share our gift. Video entries get extra credit! Our day to choose is Tuesday, Nov. 22nd. Hit our Facebook Page, or our Twitter Feed (use the hashtag #passthecrown), and let us know if we should keep this gift, or take a risk on the next one. Let's have some fun! Over the course of the next 3-4 weeks everyone playing the game (including us, The Happy Hour Guys) will receive an awesome gift from Crown Royal on a pre-designated day at 9AM. 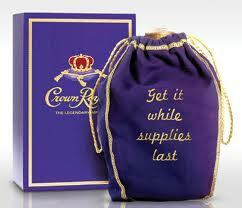 The gift will be virtually wrapped in an iconic Crown Royal purple bagembroidered with a hint as to what's inside. Upon receipt, we will have until 5PM that day to decide if we want to open the bag and find out what's inside, or steal a gift already opened by a person before us (2 iPads, etc.) - Forcing them to take whatever was in our bag! So on the 21st, your job will be to tell us what to do! Once again, Hit our Facebook Page, or our Twitter Feed (use the hashtag #passthecrown), and let us know if we should keep this gift, or take a risk on the next one. HERE WE GO! Our MYSTERY BAG has arrived! The clue: "TIMELESS". Shall we keep it? Steal someone's stuff? What do you think "Timeless" means?